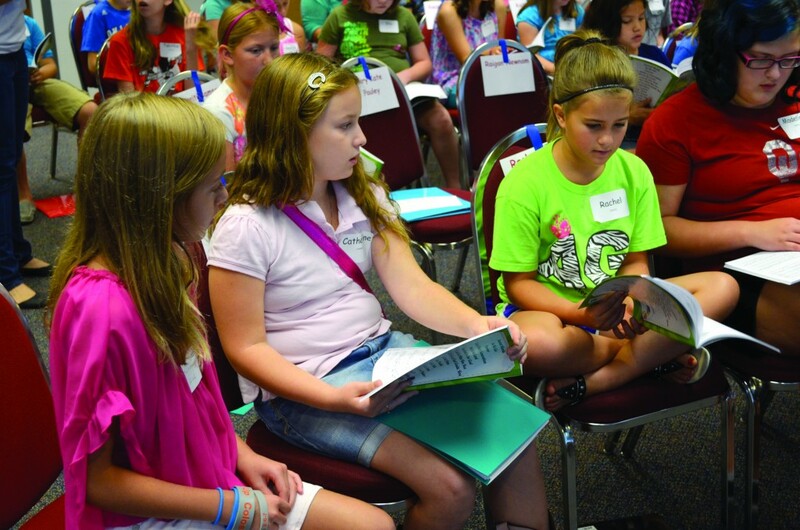 From left, Hadley Hill and Catherine Johnson, Edmond; Rachel Hofeld, Harrah; and Madeline Gentry, Choctaw, learn a new song. 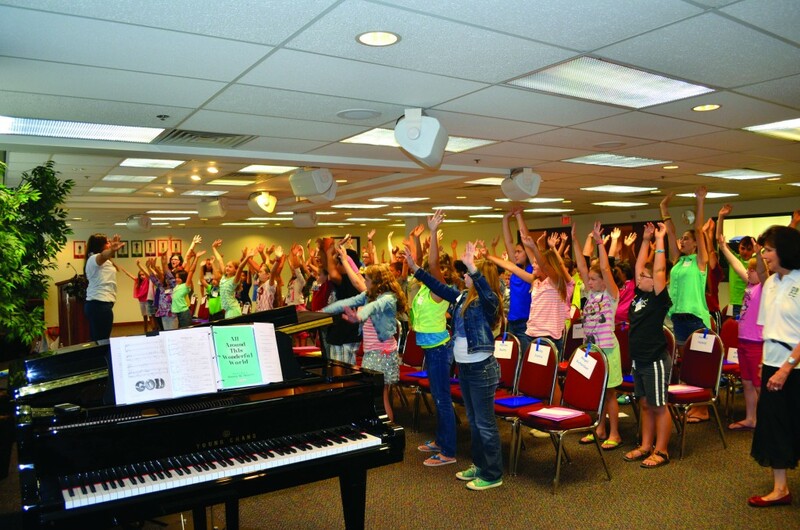 Young singers from virtually every area of Oklahoma gathered for a four-hour retreat at the Baptist Building in Oklahoma City Sept. 14 to officially launch the first season of the Oklahoma Baptist Children’s Chorus (OBCC). More than 80 of them convened in the Tanner Chapel to help fulfill the vision of Baptist General Convention of Oklahoma (BGCO) Worship and Music Specialist Randy Lind. Directing the OBCC is Wynn Anne Hook, BGCO Cooperative Program and association relations administrative assistant, accomplished pianist and a member of the Singing ChurchWomen of Oklahoma. Associate directors are Morgan Gordan, music teacher at Stanley Hupfeld Academy, and a member at Edmond, Henderson Hills, and Rebecca Upshaw, choral director at Putnam City High School, and a member at Oklahoma City, Southern Hills. 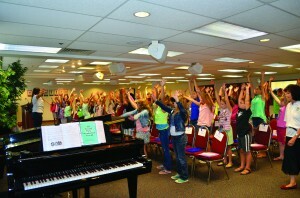 “Wynn Anne is a very experienced children’s chorus director, and Rebecca and Morgan are incredibly talented,” Lind said. “These three ladies are going to love the students, direct them in a wonderful way and lead them to love our Lord. Hook said she has been excited about the new undertaking. “It’s been great starting at the ground floor with this,” she exclaimed, crediting Lind’s vision. “We formed a committee, first, to talk about it, and then Randy came and asked me if I would direct it. He then asked the associate directors to get involved. Associate director Morgan Gordan leads the chorus in warm-up exercises as director Wynn Anne Hook, right, observes. 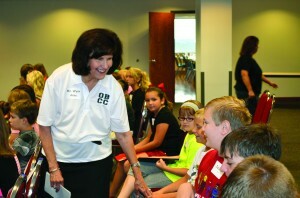 Almost seven dozen children in grades 4-6, ages 9-12 eventually were selected for the OBCC. Some are outgoing; some still a bit shy. As Hook so eloquently reminded the young singers as their retreat began Sept. 14, their voices are “an instrument” which can be used to glorify God. Hook personally greets the chorus members prior to the beginning of their retreat. The OBCC’s theme Scripture this year is Matt. 5:16, and the leaders are teaching the children to be the light of the world. “Several of our songs revolve around helping them to think about being the light of the world and at the same time, presenting the Gospel to them, too,” Hook said. The OBCC will sing at several events during its first season, including their first concert at 3 p.m., Nov. 17 at Edmond, Waterloo Rd. ; at Rose Day, Feb. 5, 2014 at the Oklahoma State Capitol; Feb. 27, 2014 prior to the Singing ChurchWomen of Oklahoma Concert at Harrah, First; and at 3 p.m., April 27 at Putnam City High School.